Before Babington’s Tea Rooms opened in 1893 in the Eternal City, the only place where you could get tea in Italy was from a chemist. Kevin Pilley reports. When in Rome you must do what more Romans are doing. And have some ‘White Passion’, a very more-ish ‘Blue Lady’ and a large slice of the Commonwealth. When in the Eternal City, turn your back on all the froth, ignore the Arabica beans, the ‘baristas’ and their ‘moka’ machines, scorn the lattes and reserve a table, a three-tier cake stand and order some traditional, hot, buttered toast and hot, buttered, Italian-made English muffins and go for the 125th anniversary high tea at Babington’s Tea Rooms at the foot of the Spanish Steps in Piazza di Spagna. Before Rome’s historic first tea room opened in 1893 you could only get tea in Italy from a chemist. Tea was only drunk as a cure for the flu – raffreddore. Italians only drink ‘Canarino’ lemon tea. Italy’s obsession with coffee and kick-start breakfasts can be traced back to south Italy’s Salerno medical school and 10th to 13th century texts. But Venetian merchants didn’t start dealing in Arabic coffee beans until the 17th century. Coffee roasting (torrefazione) only really began in earnest in the 1960s. Italy now has more than 600 coffee-roasting companies. But it was two colonial British women who introduced tea to the Italians. Isabel Cargill’s Scottish father, William, founded the Otago settlement and Dunedin in New Zealand, and Anna Maria Babington was descended from the Anthony Babington who was hanged for plotting against Queen Elizabeth I. These two women decided that what Rome was missing was a tea shop. Their first tea shop was in Via Due Macelli, moving to the former stables of the 18th-century palazzo designed by the same man who built the 135-step, 1725 Spanish Steps up to the 1585 Trinità dei Monti church and down to Bernini’s 1629 “ugly leaky boat fountain” – Fontana della Barcaccia – commemorating the flooding of the River Tiber in 1598. The iconic orange-fronted tea rooms are close to the Casina Rossa (Keats-Shelley House). The poets reportedly patronised the Antico Caffe Greco. The world’s first coffee house was probably Istanbul’s Kava Han (1554). Caffe Florian on Venice’s Piazza San Marco opened in 1720. 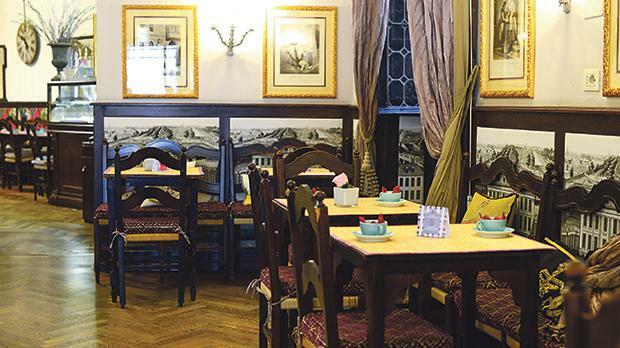 Padua’s Pedrocchi Café dates to 1760, the same year the Roman Greco opened for business. But Babington’s is certainly the oldest Italian tea room. Its novel, eye-catching brown linoleum and Italianate Victoriana ambience soon became all the rage. It became part of the Grand Tour – a rendezvous “where ladies or gentlemen, hard at work sightseeing, could go to refresh themselves with a comforting cup of tea” and “a fashionable establishment for a select clientele”. Babington’s novel, eye-catching brown linoleum and Italianate Victoriana ambience soon became all the rage. Above: Tea is served in silver-plated pots with Richard-Ginori porcelain. Top right: Some cakes and pastries are fourth-generation recipes. A little corner of English eccentricity in Rome. Isabel married artist Giuseppe da Pozzo – the portraits of Anna Maria and Isabel hanging in the tea room are by him. Anna Maria moved to Switzerland, dying in 1929. The rooms and the tea trend somehow survived World War II, closing only for a few hours on Liberation Day. It quickly became a celebrity magnet. Richard Burton and Elizabeth Taylor publicly secretly met there during the filming of Cleopatra. “The first tea was named Mascherino after the family cat. 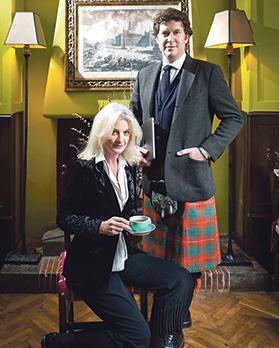 It’s still our logo,” says Rory Bruce, who runs Babington’s with Chiara Bedini. They are the great-grandchildren of Isabel Cargill. “We’re not famous for being cheap. But we’ve always offered simplicity and qua­lity. And seats! Tea is served in silver-plated pots with Richard-Ginori porcelain. Bruce, 49, a direct descendant of Robert the Brice, lived in Italy until he was six before going to boarding school in the UK and then moving to Majorca. In Italy he worked for Fendi Boutiques. Melania Lopez is Italy’s only tea blender and Certified Sensory Taster. And professional ‘Nose’. She is behind Babington’s Seven Teas of Rome range. “Arrivederci Roma is dedicated to Fontana di Trevi. White marble, clear waters, love. I ‘translated’ the brief into tea by using ingredients which tell that story – white teas and freshness of the bergamot,” she says. Babington’s is certainly the oldest Italian tea room. The house’s ‘white passion’ is Pai Mu Tan, with pears, peaches and other exotic fruits. The popular ‘Blue Lady’ in residence comprises figs, rhubarb, cherry and pineapple. Teas are infused with everything from gingko, ginseng, linden, lemon verbena, burdock root, chamomile, dandelion and bioloba. The tea list stretches from rose congue and pinhead gunpowder to seaweedy ‘Genmaicha Uji Bio’. Coffee is also served – Kenyan, Ethiopian, Indian and American. Times have had to change and also served throughout the day, as well as mignon cakes, are pancakes with Canadian maple syrup, Madagascan Cola, red rhubarb iced tea, Bulldog Strong Ale, key lime pie, pilaf curry and even burgers. Babington’s introduced the burger to Italy. Rory Bruce, who runs Babington’s with Chiara Bedini. They are the great-grandchildren of Isabel Cargill. The wellness industry is driving up tea sales in coffee-centric Italy. Polymenols and anti-oxidants are taking on caffeine. 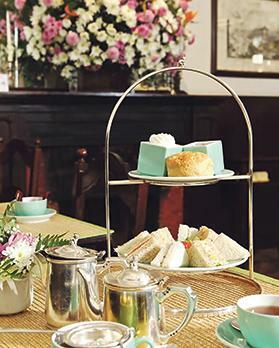 Hotels are increasing their tea lists. Rome also boasts tea gardens like Il Giar­dino del Te and Il Giardino de Cliegi. 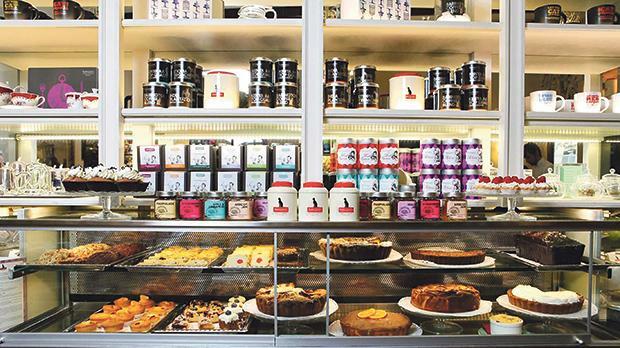 Milan has a growing tea scene. Bologna hosts an annual tea festival. La Via del Tè is making artisanal teas in Florence. 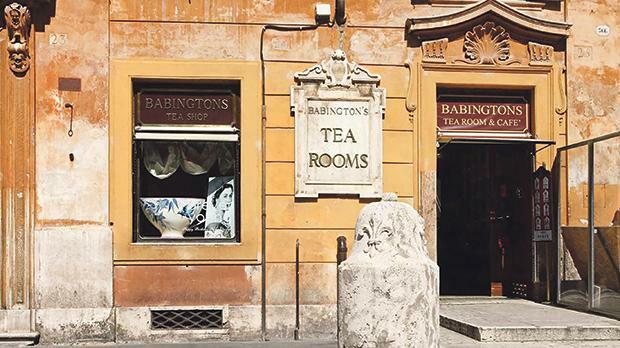 Babington’s Anniversary Blend com­memo­rates Italy’s two female tea pioneers. The Ceylon and Chinese black consist of vanilla, elderflower, blueberries, juniper and rose petals. Two grams per 200ml at a temperature of 95 degrees Celsius and a three-minute steep or infusion is recommended. Babington’s is also the only place where you can have ‘A Stroll In The Forum’ while being seated. Its tree green bespoke ‘Sencha’ tea symbolises the sacred and profane.